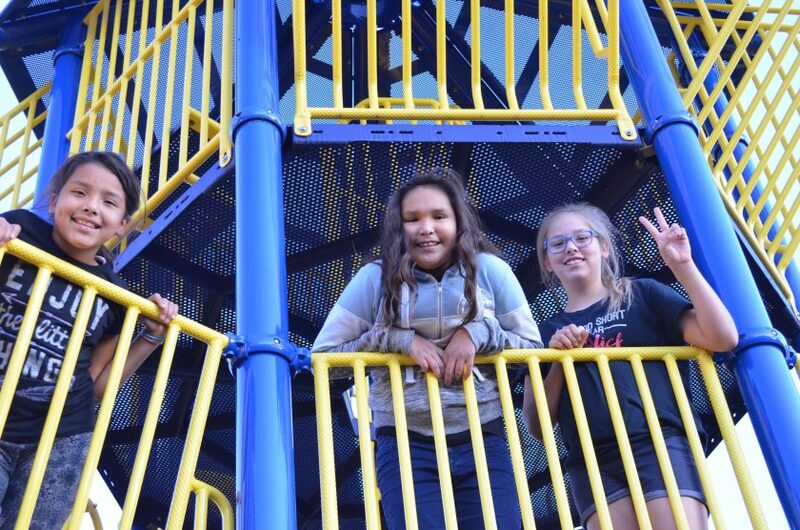 St. Joseph’s students spending time outdoors this fall on the playground. Grandma also always had an envelope full of her latest pictures in her purse for folks to look at. When she passed away, we sorted through what seemed like millions of pictures in her garage. Some were really good and some, well, weren’t the best. Some of the pictures grandma took marked major life events. Some left us wondering who/what the pictures where about and why she would take them. Nevertheless, in the end, all the pictures where important to her. Growing up, it was pain to have grandma on the ready with her camera. Always wanting a picture of some event. I could never really understand her need and desire to have the camera and envelope on the ready. Why would she put so much time into producing so many pictures? 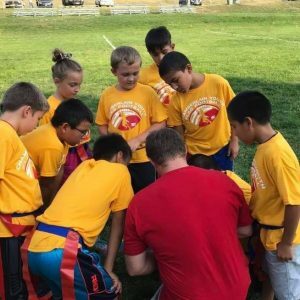 St. Joseph’s and Chamberlain community kids come together for some flag football. I share all this as I starting thinking about all the pictures I take here at St. Joseph’s Indian School. I went through my picture file and it has almost 2,000 pictures in it from the first semester alone. I take pictures at major events on campus, kids playing, in the daily grind of school, their artwork; you name it and I am taking a picture of it. Some are really good! Some, well, not so good. Some show up on our public Facebook page and most are shared with our families. With the millions of pictures, grandma was able to share events and occasions with folks who could not be there. She made sure she had copies on the ready for anybody that wanted one and would freely give them. Grandma enjoyed talking and sharing about the experience – who was there, what happened – and in the end, the shared sense of community the pictures brought. Importance of community that is the lesson she was teaching all her life without realizing the importance of what she was doing. The lesson I learned without realizing Emerald was teaching. 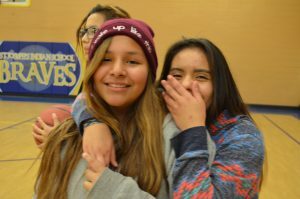 Students share a laugh while at the Rec Center. At school, I am able to help build a sense of community between the families, supporters and staff through the good and not so good pictures. I able to highlight a small slice of what happens on campus so they can experience the events with our children through pictures. My hope is our parents and supporters can feel a part of what we do through the pictures we share. We as adults are continuously teaching lessons, even if we do not realize it, just as grandma did. Some of the lessons will not bear fruit for many years but others will. Our staff strive to plant the ideas and teach the lessons our students need to become productive members of their communities. We do this through direct teaching, indirect teaching, role modeling and accountability. What we do isn’t for the short term rewards, it is for the long term gains. My hope and our mission is our students remember things we did, lessons we taught, and the meaning of the lessons will become relevant and clear. The meaning of the lesson that grandma taught about community has become clear to me and I hope the same happens for our students. A picture is indeed worth a thousand words and a thousand memories. We couldn’t agree more! Thanks, Jarry! Extremely well written by this student, and I thank him for knowing what is important and for sharing it with us! Of the school children are very nice. Thanks, Deborah! We’re glad you enjoyed the story! Your love and dedication of these children shines through your words, and pictures which are worth a thousand words! Thank you for your service…keep up the good works!! Thanks, Lana! We’re so glad we have such dedicated staff members.